BOHO MARKET: Giveaway Alert: Adorable necklace! 1. 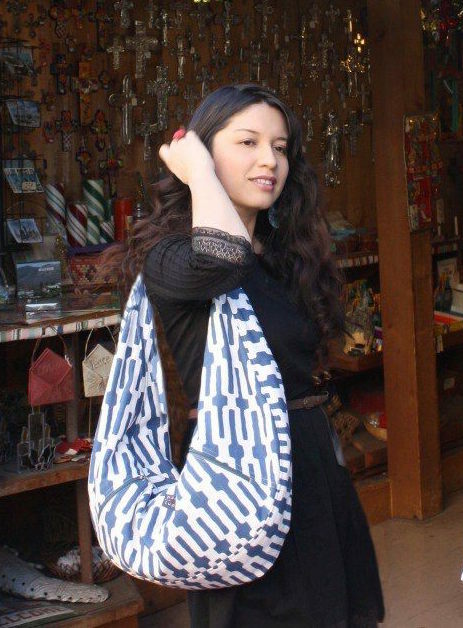 Become a Boho Market follower. If you're already a follower, just say it on your comment. 2 .Visit the Silver Dog Jewelry store HERE and pick your favorite item. Then come back and let me know which one you chose. 3. If you don't have a blog, please include your email so I can let you know if you're the lucky winner. You have until this Friday at noon to enter to the giveaway. Good luck to everyone!! Hora de sorteos! Siii! La linda Erin de la tienda en Etsy "The Silver Dog Jewelry" esta sorteando entre los lectores de Boho Market este hermoso collar, muy único y femenino. Me encanta la combinacion de colores y sobre todo la rosa de color naranja, muy apropriada para esta estación! De seguro que tan pronto como se pongan este collar mucha gente les va a preguntar donde lo compraron, ya que el diseño y los colores son muy hermosos. Erin también tiene un lindo blog, pueden visitarlo Aqui. 1. Seguir este blog, si ya lo estas siguiendo, solo debes mencionarlo cuando dejes tu comentario. 2. Visita la tienda en Etsy The Silver Dog Jewelry AQUI y escoge la pieza que mas te guste, luego regresa y menciona en tu comentario cual fue la que escogiste. 3. Si no tienes un blog, por favor deja tu email en el comentario para poder comunicarme contigo en caso seas el ganador (ra). Tienen hasta este Viernes al mediodía para entrar en el sorteo. Buena suerte!! Hy! My favorite piece is the Handmade Necklace Vintage Rose Locket and Charm! another giveaway?! That's so great! It is so hard to choose one! There are so many that I like! ok. It will be the Handmade Necklace Vintage Rose Locket and Charm! Yes! I'm your follower indeed:) and it's pretty hard yp choose my favorite because i love them*teehee* To answere your question i'd love this piece *Earrings Blue Rose and Vintage Cameo* It's lovely! I'm a blog follower and for the shop, I really like the asymmetrical flower necklaces. The blue + orange color combo is my fav too. Ohh what a shop! My favourite is the long vintage rabbit locket, I have such a soft spot for bunnies! No fue fácil!!! Pero elijo Handmade Earrings Brass Filigree Hoops and Teal Faceted Glass. Son muy lindos!!! Great giveaway :) I am now a follower. Love this necklace! So hard to choose a favorite from the etsy shop, but I'll go with the vintage hedgehog locket--I may have to buy it soon if no one beats me to it! The color combo on this necklace is divine! So bright and cheery, I love it! Happy Monday! I don't know about my favorite (there were so many! I couldn't look at all of them!) but I know I love the Handmade Necklace Teal Blue Dahlia and Red Sponge Coral. definitely. Hey girl, I'm not entering the giveaway, although you have such fantastic ones !! I just wanted to drop in and say hello. Hope you had a fantastic weekend and that your week is off to a great start! I'm a follower! And I love the coral pink rose and black glass necklace, because the black beads really make the flower pop. Thans for the opportunity on the giveaway !!! I'm a follower of your blog. From the Silver Dog Jewelry, I love the Necklace Silver Love Letter and Pink Heart it looks simple but elegant and sweet. I'm a follower! Love the Vintage Victorian Sapphire Jewel and Swarovski Pearl necklace and the Brass Filigree Hoops and Teal Faceted Glass earrings. 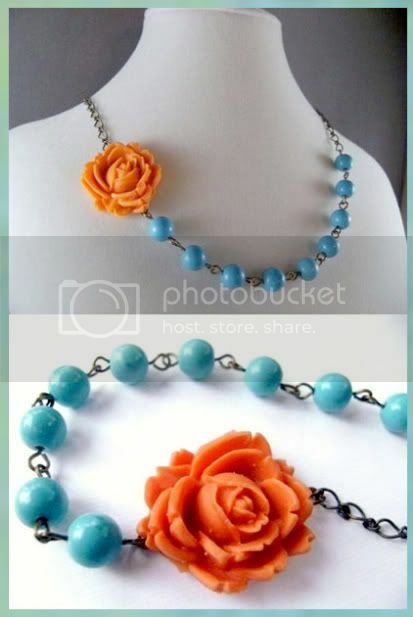 Another piece I really love is the Blue Rose and Coral Reef necklace! wno igual naa pierdo intentando..
La info de tu Blog es re interesante..
Mi item Favorito es "Sally Necklace Black Rose and Vintage White and Black Swirl" (esta locazo!!!). - Hace poco me he suscrito a tu blog "Activate your Email Subscription to: BOHO MARKET"..
That's such a pretty necklace. And I'm a follower via bloglovin and blogger. I think the Handmade Necklace Vintage Style Red Peony Rose and Pearl is absolutely gorgeous! I like the blue cameo earrings (http://www.etsy.com/view_listing.php?listing_id=41451072) I tweeted, but I'm not really sure how to link it...sorry, you don't have to count that entry if you don't think it's legitimate, but you can check my tweets @sammisuits. i absolutely LOVE her jewelry!!! love the colors...turquoise and orange...great combo! and you know i am a very happy follower of yours!! I found your blog via Silver Dog and just became a follower!! It was WAY to hard to pick a favorite!!!! I narrowed it down to the Peaceful Cream Riverstone necklace and the Yellow Rose and Green Turquoise necklace. If you are going to make me pick I guess it would be the Peaceful Cream Riverstone necklace. But please can I love them both?!?!?! Thank you for the lovely giveaway! I like the Necklace Silver Love Letter and Pink Heart! And here's the sweet tweet! Her Etsy store has some really beautiful pieces! I really like the Handmade Necklace Yellow Rose and Green Turquoise - so pretty! P.S., I am already a follower of your super lovely blog. Wonderful giveaway...count me in please! And i'm a follower of course! Oh my goodness....so so adorable..I would love to wear that beautiful creation. Mhmmmm! Love this giveaway...I'm follower U, Honey! I'm a follower! I love the green rose necklace, but th eone your giving away is fabulous! The necklace you are giving out is very beautiful. I like the contrast in colors. Orange and blues make very happy moods. my favorite is the red rose ring or blue butterfly necklace! This is a wonderful giveaway. I like the website, lots of beautiful stuff on it. I particularly like the Shiny Silver Leaf Cluster Earrings ($12.00). Thanks for the heads up. Have a great day, my dear. and, i am already a follower. hi darling! thanks for visiting me and reminding me of the giveaway! my fav happens to be the giveaway one! love the orange rose! hope you have a happy easter dear! I love so many of them... and I just ordered a couple of pieces yesterday... but my next will be: Handmade Necklace Teal Blue Dahlia and Red Sponge Coral! I love vintage jewelry! my favorite was the Handmade Necklace Teal Blue Dahlia and Red Sponge Coral. I just "liked" BOHO Market on Facebook. just joined the email list!